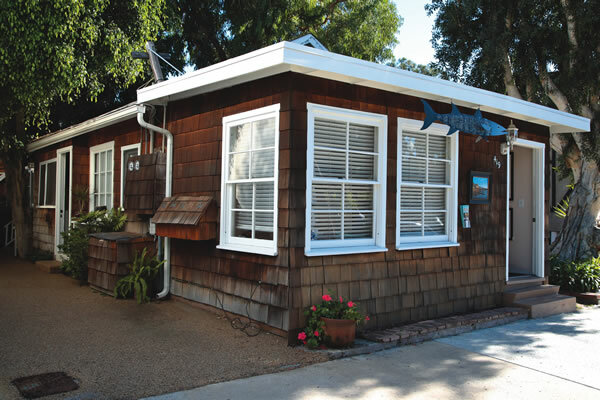 Known to tourists and locals alike as a hub of quaint boutique businesses, Ocean Avenue is comprised of many properties that serve as live/work studios. 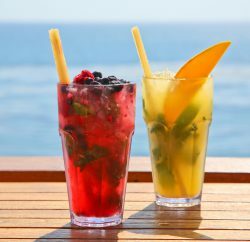 With its European village flavor, the area is sort of the “Soho” of Laguna Beach. One can grab a latte at Zinc or Anastasia cafes and walk to the many different art galleries and studios while shopping the Bohemian-style goods at the open market on Saturday mornings. 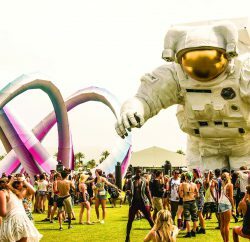 Amongst the attractions are the studios of famed local artists including the Vanessa Rothe Studio and Peter Blake Gallery, Anastasia Boutique, the hip furniture store Trove, Hillary’s chic clothing for kids—and a shoe repair that can fix a broken Louis Vuitton handle in a pinch. 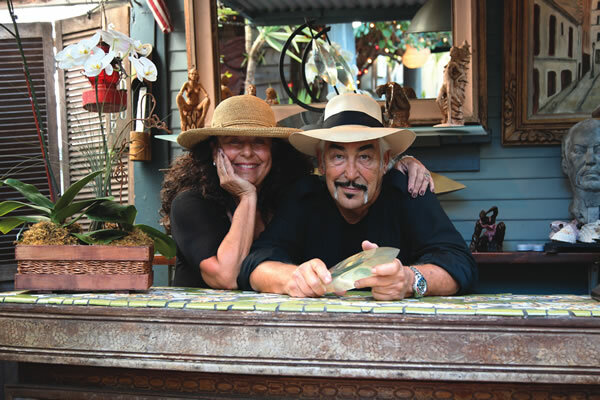 The live/work space at 419 Ocean Ave. has been home to painter and photographer Cliff Wassmann since 2008. When hunting for a live/work space, the artist immediately fell in love with its downtown location and the fact that it is walking distance to the art festivals in which he has participated for the past 25 years. 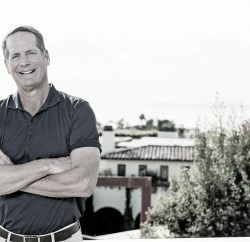 “The fact that it is two blocks from the beach was added incentive,” Cliff says. After moving in, Cliff went to work converting the front room into a studio and moved all the living space into the rear of the building, which also has a quiet courtyard he shares with three neighbors who reside in the building behind him. “Having them there really creates a sense of small community,” Cliff notes. He and his 12-year-old daughter Nova live in the front 850-square-foot building, which was built in 1913. A traditional Laguna cottage with hardwood floors and wood beams, the building has not changed much over the years. Although small, the many windows provide ample light and an upstairs A-frame attic area serves as extra space. With the kitchen and other living areas in the back, Cliff cleared out old fixtures from the front room and converted the space to his painting studio. 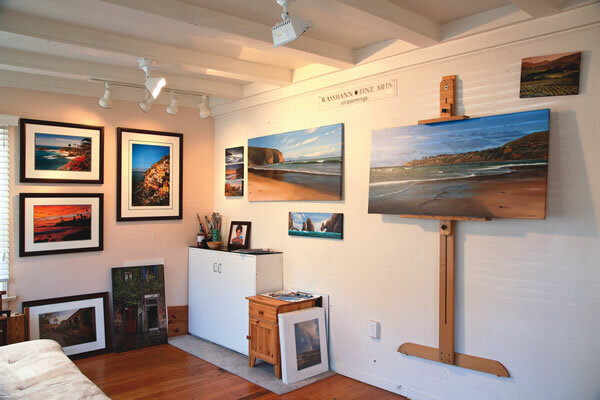 And the Laguna lifestyle has been good for Cliff, who makes his living as a semi-photorealist painter and draws inspiration from the shoreline of the Pacific coast. With his front windows facing Ocean Avenue, it is not uncommon to see people peering in to see what new paintings are on the easel. “Being slightly elevated from the street, it feels like a stage sometimes,” Cliff says. Since its inception two years ago, his public studio has been on the city-sponsored open studio tour, which generally occurs on the first Saturday of each month, but visitors are welcome whenever the artist is present, and it’s a popular stop for those going to the farmers market each Saturday. Cliff and Nova (12) Wassmann. DAY JOB: Cliff is a semi-photorealist painter, professional photographer and web designer. SPACE: 850 square feet, two bedrooms, two baths. HOUSE TIMELINE: Built in 1913, moved in 2008, renovations in 2008 and onwards. FABULOUS FEATURE: The home is one of the original Laguna Beach cottages used by the California impressionists that secured the town’s reputation as a thriving art colony. On the last block of Ocean Avenue near Forest Avenue, Michael Evans lives on a large property at 442 Ocean Ave. that he remodeled himself. Although He lives with his wife, fashion designer D.N. Evans, there are two separate residences on the property, with separate artist studios and addresses (hers being 432 Ocean Ave.) … all of which is conjoined by a beautiful courtyard. When the couple moved to the property in 1975, the complex was divided into four apartments. Michael, who has been an artist and in construction all his life, began to work his magic, remodeling every room in the house. In total, the original property had 11 rooms that spanned across 3,800 square feet. It was even rumored to have once housed Tennessee Williams in the 1950s. Off the courtyard and main house, Michael’s space includes bachelor-style sleeping quarters and an art studio that is outfitted to offer guests a special laser light show. Wooden beams frame the door to the studio with skulls perched at the top—a fun and foreboding message to visitors—and inside, fascinating geometrically designed art fill the space. 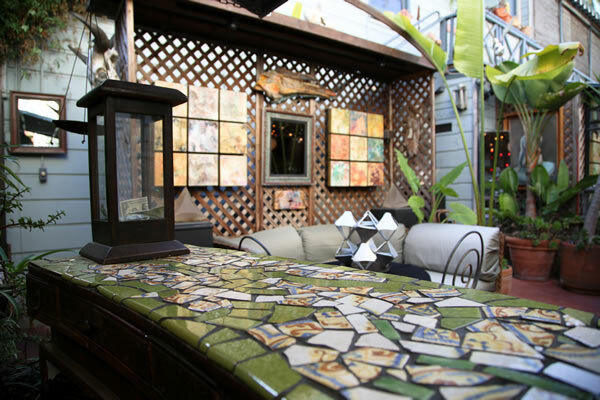 Michael’s love of creating art from throwaways is evident in the whimsical, New Orleans feel of the outdoor courtyard, complete with a mosaic Michael created using reclaimed broken Mexican tiles. The recipient of two Laguna Beach Beautification awards for landscaping, Michael created a courtyard with something unique to see at every turn, be it a piece of burnt timber reinvented into a canvas for beautiful wall art, or interesting plants weaving their way across the fence. Designer D.N. 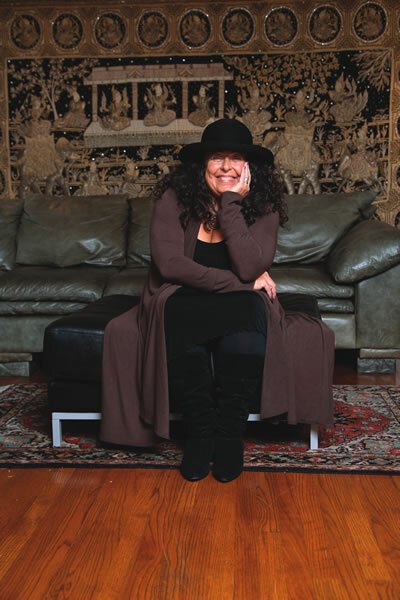 Evans lives in the early Mediterranean-style main house and has an adjacent clothing studio on the property that she opens each Saturday to the public from 10 a.m to 2 p.m. (by appointment). While the main house boasts three bedrooms, a kitchen, one full bathroom and two decks, the studio is filled with D.N.’s one-of-a-kind jewelry and garments that have been featured in Vogue and Harper’s Bazaar. The building itself is a quaint clapboard construction built in the 1930s, while the home was conventional construction likely built in the 1940s. 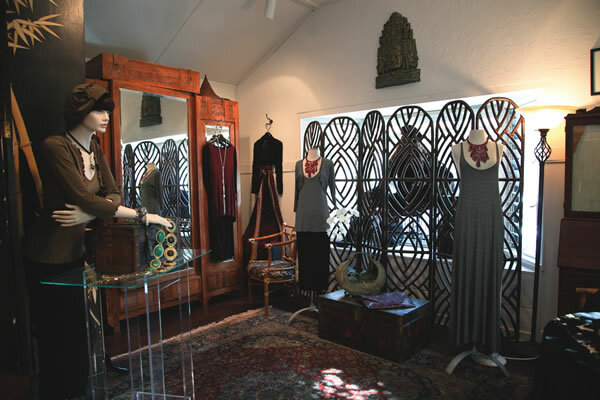 D.N.’s upscale travel garments, that have clothed such celebrity clients as Barbra Streisand, are showcased throughout the modest and inviting space. Michael and D.N. have two children together and four from prior relationships—that they raised together. FAMILY FACTS: Michael, D.N. and Manolo (11) (live-in grandson) Evans. Grown children: Chris, Damen, Lara, Eris, Ron and Leesa. DAY JOB: Michael is an artist and D.N. is a fashion designer. 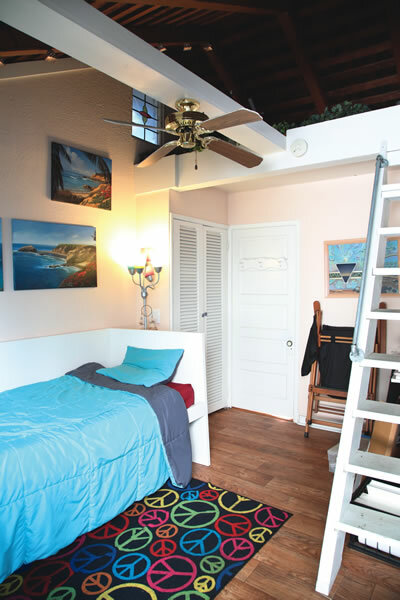 SPACE: 3,500 square feet (combined), three bedrooms, two baths, two art studios. HOUSE TIMELINE: Built in the 1930s and 1940s, moved in 1993, renovations in 1993 and onwards. We loved reading about D.N. and Michael. They are wonderful, fun and amazing people and we feel blessed knowing them. Wish we lived closer so we could see more of them. Wow DN did not even tell me about this article. How humble of her !!!!!! What a wonderful surprise to see my friend DN and her husband after so many years. I love, Love, your magazine and will look for more info. on facebook. I love DN’s clothes and hope to acquire more original works of her art. Thank you! We love our Habitat section because it truly showcases locals’ personal styles and tastes.